04.05.18 Each year the US Chess Federation selects affiliates in a number of categories as part of its Membership Appreciation Program (MAP). Winning affiliates are those who have signed up the most new and renewing US Chess members. For the category of Small State Affiliate, Maine was recognized with the top three places: 1. Maine Association of Chess Coaches 2. All Saints Catholic School Chess Club and 3. John Bapst Memorial High School Chess Club. 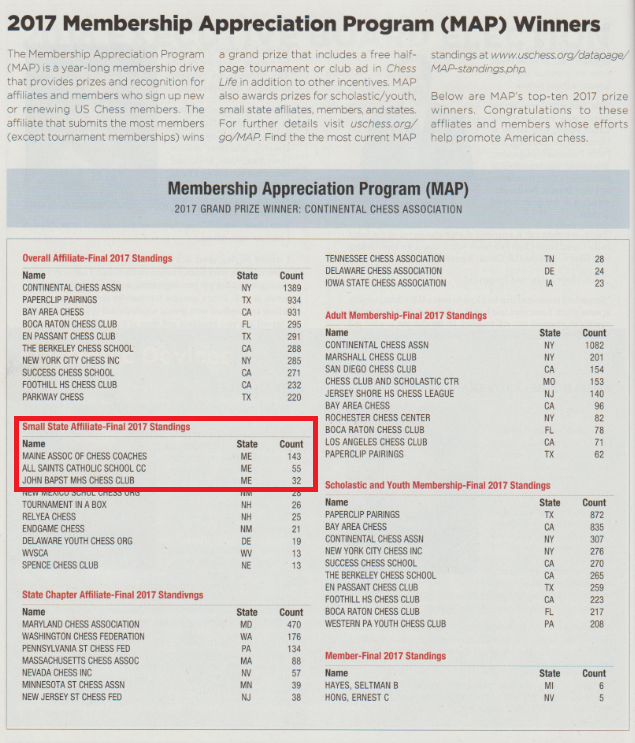 The US Chess Federation has selected three Maine affiliates as the top point getters in the 2017 Small State Affiliate Membership Appreciation Program. Congratulations to these affiliates and their hard-working volunteers. Your efforts to promote chess in Maine are very much appreciated! Wonderful! What a great tribute to the hard work of Maine's scholastic coaches! Congratulations!